This live recording, from an August, 1983 performance in Germany, marks the third overall single release of “I Will Follow,” following the 1980 release of the album version from Boy as a single, and the 1982 release—in The Netherlands and Germany—of a different live performance of the song. 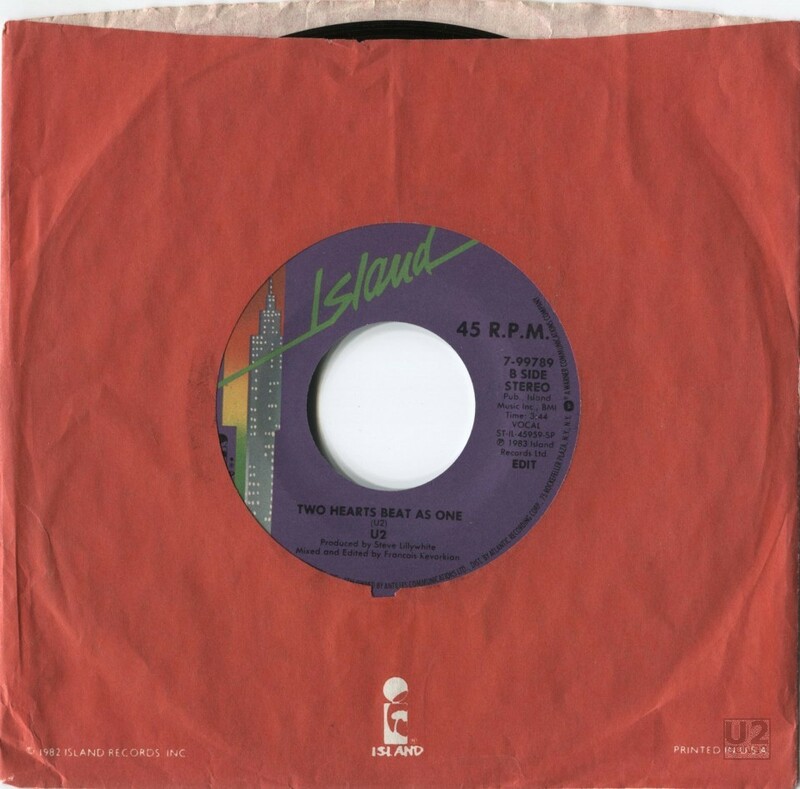 This third version was issued to promote the Under a Blood Red Sky album, as Island Records felt that a radio single would help sales of the LP. A special promotional 7-inch single was produced, featuring the Under a Blood Red Sky version of “I Will Follow” on side A and a special edited version on side B, which removed much of the crowd noise for airplay. The commercial single featured the Under a Blood Red Sky version as the a-side, with “Two Hearts Beat as One (Import Mix)” on the B-side. (This track, an edit of a longer Francois Kevorkian remix, had not been previously available in the USA.) The single, housed in a no-frills generic sleeve with no additional artwork, was only commercially released in the USA. This recording of “I Will Follow” is taken from the August 20, 1983 concert in St. Goarhausen, Germany, which was part of the Rockpalast Festival. Several tracks from this German concert (“I Will Follow,” “Sunday Bloody Sunday,” “The Electric Co.,” “New Year’s Day,” and “40”) were included on the Under a Blood Red Sky album. However, the companion video, U2 Live at Red Rocks: Under a Blood Red Sky used performances exclusively from U2’s June 5, 1983 performance at Red Rocks Amphitheater in Denver, CO.
“I Will Follow” is one of U2’s most-performed songs, appearing regularly in set lists as recently as 2011’s U2360° Tour. Beyond this release, it has been issued in an official capacity many times. A version recorded live in-studio on September 18, 1980 was released on One and Only: 25 Years of Radio One. A live version from Boston on March 6, 1981 was released as a b-side to the “Gloria” single, and also appeared on the Live from Boston 1981 section of The Complete U2 release on iTunes, and on the deluxe version of the October remaster. A live version from July 4, 1987, recorded in Paris, was released on the iTunes release Live in Paris (and also the DVD accompanying the super deluxe reissue of The Joshua Tree). The December 31, 1989 performance from Dublin featured on the Love: Live from the Point Depot section of The Complete U2. The December 3, 1997 performance from Mexico City was released on the fan club album Hasta La Vista Baby! as well as the Popmart: Live from Mexico City DVD and VHS releases. The December 5, 2000 performance from New York City was used as a b-side on the “Elevation” single as well as on a CD given away with copies of The Sunday Times newspaper. The June 6, 2001 version from Boston, MA was used on the Best Buy-exclusive “3 Tracks Live from Boston” promo CD, as well as on the Elevation 2001: U2 Live from Boston DVD. A live version from Brooklyn on November 22, 2004 was featured on an iTunes-exclusive EP, “Live from Brooklyn,” and a version recorded live in Milan in July, 2005 was featured on the deluxe version of 18 Singles when purchased through iTunes (as well as on the DVD accompanying the deluxe CD version of 18 Singles). Finally, U2’s performance of the song at the Glastonbury Festival in 2011 was released as an iTunes exclusive. Alternate versions of the studio recording of “I Will Follow” do exist. On some promotional singles, the album version was released in a mono format. On other promos it was edited to 3:22 in length. A studio version without the countdown at the start was released on The Last American Virgin soundtrack album. Finally, an “Alternate Version”—actually an early mix by Steve Lillywhite, done without the band’s input and featuring prominent acoustic guitars—was released on the remastered deluxe version of Boy. The album version of “I Will Follow” has been re-released multiple times on many U2 compilations, including several promotional releases as well as The Best of 1980-1990 and, as a bonus track, on the UK version of 18 Singles. I Will Follow (Live): Produced by Jimmy Iovine. Mixed by Shelly Yakus. Two Hearts Beat as One (Import Mix): Re-mixed by Francois Kervorkian at Sigma Sound, NYC. Re-mix Engineer: John Potoker. Assisted by Glenn Rosenstein. No cover art with single.